The most important and basic thing you must do before anything else is find a motorcycle helmet to work off of. It doesn’t matter what color it is or if it has a design on it. Everything will be covered by the time you’re done working, so just be sure to get one with the right shape. You’ll notice that the helmet I used has a clear face shield on it. Learn from my own mistakes and do not buy a helmet with a clear shield. At the very least, buy a replacement shield that is black and switch them before doing anything else. You don’t want to mess with trying to turn a clear face shield black if you don’t have to. To start off you’ll need to pattern the ears out. There is no special trick to doing this. Just draw out the shape of the ear onto a piece of paper and alter it until it looks how you want it to. It is a lot of trial and error. 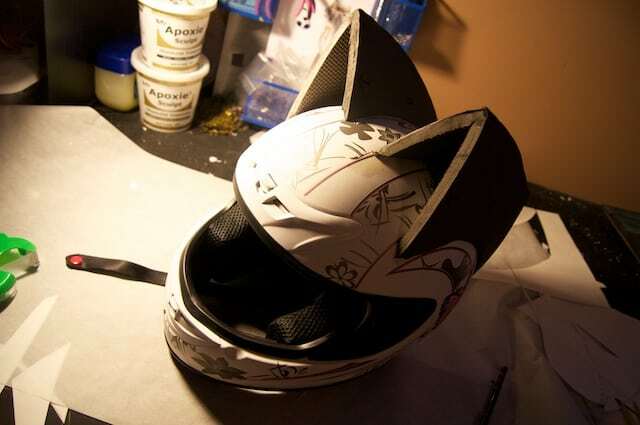 I started with one side of the ear, and altered the pattern for it until it was the right size and shape, then I taped it to the helmet with some tape. I then repeated the process for the other side of the ear until it looked the way I wanted it to as well. 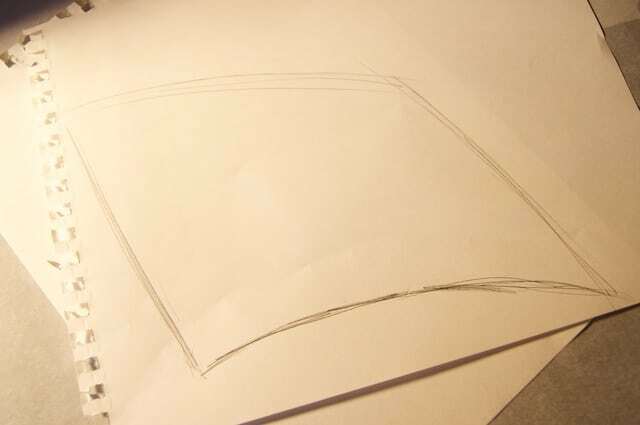 I then connected the two pieces with a small triangular piece of paper to complete the ear shape. 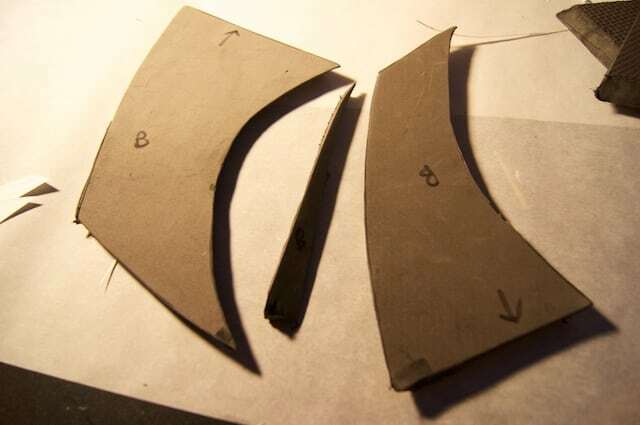 Once your ear pattern is done, use it to cut out corresponding pieces of EVA foam with a craft knife. Cut out two pieces for each pattern piece in order to make two ears. 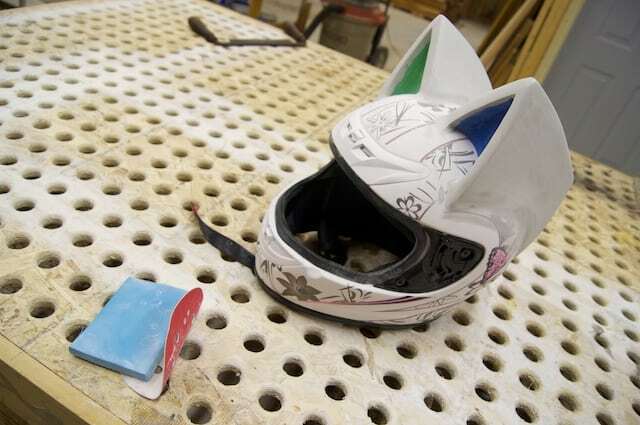 To get your foam to sit properly on your helmet, you’ll need to bevel the edges. 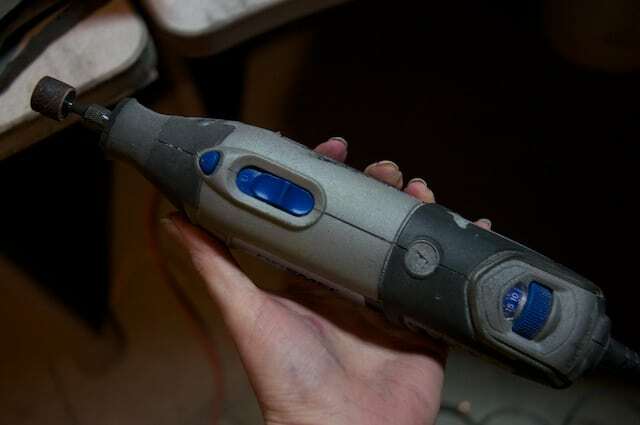 You can do this with a sharp craft knife, but its also easy to use a Dremel. 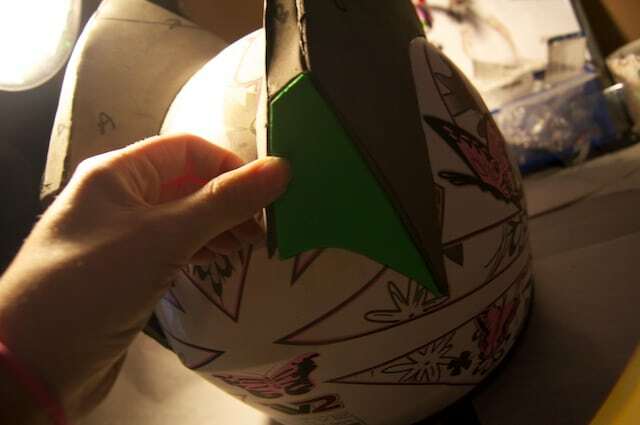 However you choose to do it, just angle the edges inward so they will fit with the curve of the helmet and also connect to each other smoothly. 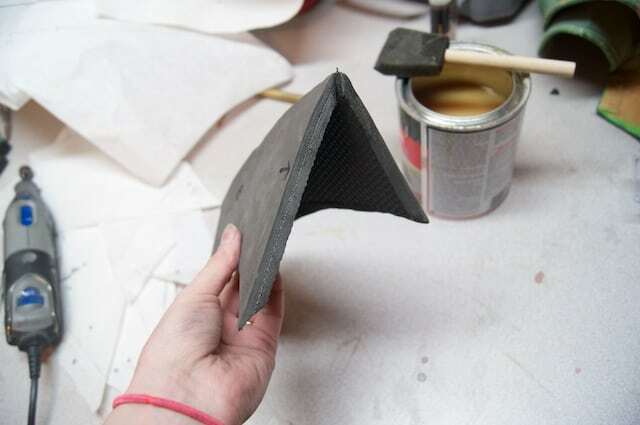 Next take your contact cement and apply a thin layer to the foam along the edges you want to glue. 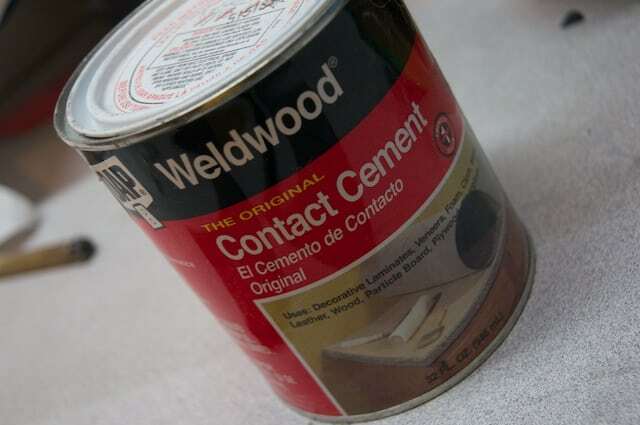 Wait a few minutes or until the cement is no longer gooey, then stick the pieces together. They should stick to each other without any problem. After that, apply a thin layer of contact cement to the top of the helmet (where the ears will attach), and to the bottom edges of the ears. Wait a few minutes again before sticking the ears to the helmet. 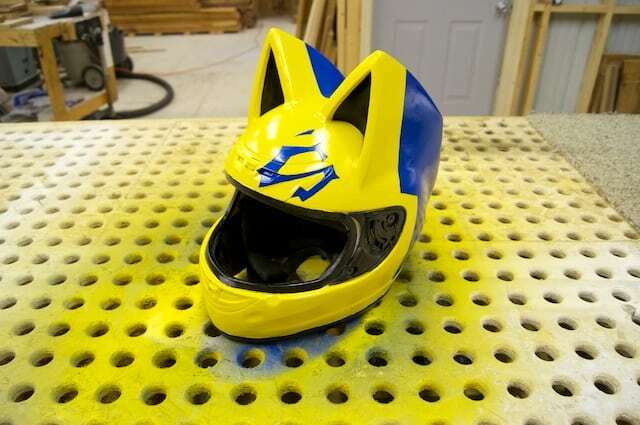 Your helmet now has a spiffy new pair of cat ears! Now you’ll need to block off the ends of the ears so that you can’t see right through them to the inside of the foam. I did this by simply cutting a piece of craft foam to fit over the ends and I used hot glue to secure them in place. For the backs of the ears, I just glued the piece of foam in place. On the front, I pushed the piece of foam inside the ear a bit to give it more of a curved surface at the front of the ear rather than just a flat one. It gives the ears more depth if you do this. Next you will need to strengthen the ears before you can continue. 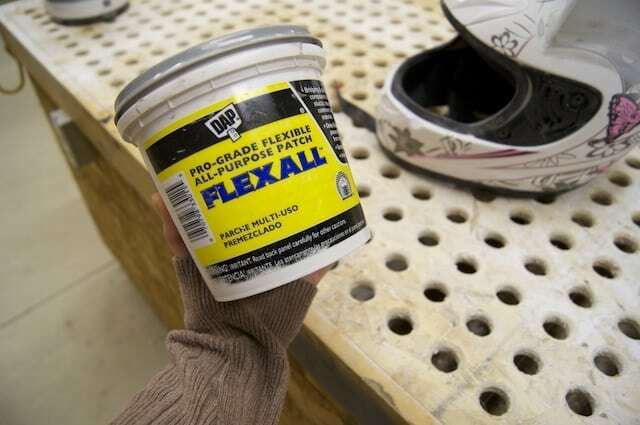 I used a drywall filler called “Flexall” to do mine, but any kind of drywall filler or even wood filler will do the trick. 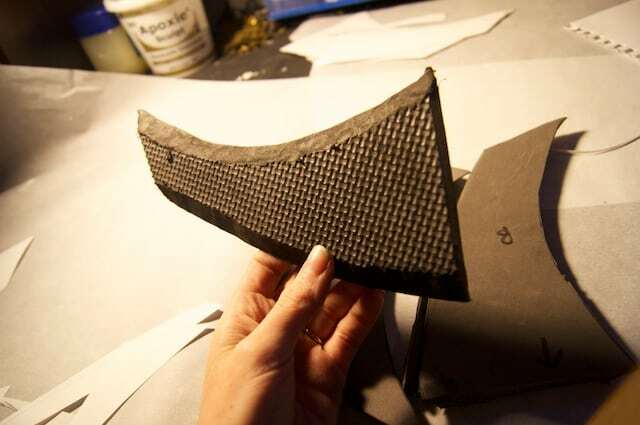 You just need something to make the surface of the foam stronger. I used about 3 layers of filler before continuing, and I applied the filler using a wet sponge brush. The wet sponge brush makes the filler spread on very nicely and also helps smooth things a bit before the filler even has time to dry. I also avoided adding the filler to the craft foam section at the front of the ear so that I could avoid having to sand in that small, curved space later. After the filler has dried for a full day, it is time to add your Apoxie Sculpt. The Apoxie Sculpt makes the ears very durable, so it’s important to add it after the filler dries to ensure that your ears will not get damaged during use. The filler simply gives you a better surface to apply the Apoxie Sculpt. Without it, the ears would be too soft to easily work with, but on its own, the filler isn’t going to be strong enough. To apply the Apoxie Sculpt, I rolled out a thin layer by sandwiching my Apoxie Sculpt between two layers of parchment paper and rolling it out with a rolling pin, and then laying it over the entire sections of the ears. This gave me a very smooth surface right off the bat. 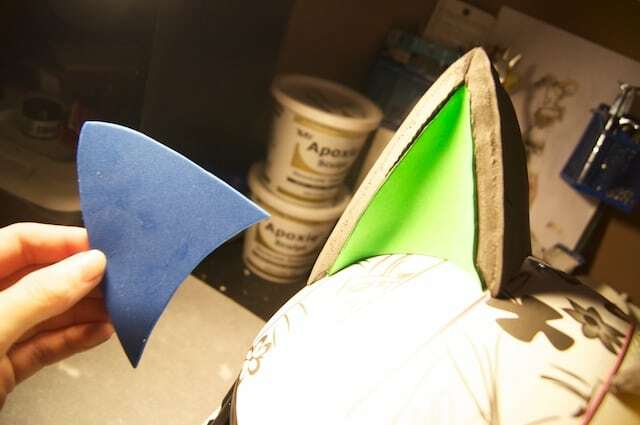 While your Apoxie Sculpt is still soft, blend it and smooth it from the ears onto the helmet as much as you can. Also, just like with the filler, avoid applying the Apoxie Sculpt to the inside of the ears at the front. Once the Apoxie Sculpt has dried overnight, sand the ears down smooth with sandpaper. I did this all by hand with 150 grit sand paper and a block of EVA foam for comfort. Don’t be afraid to sand the helmet as well while you’re at it. You’ll need to in order to make the transition from ear to helmet smooth. You can also use Apoxie Sculpt at this point to add any other details you might need. Celty’s helmet has a raised edge around the inside of the back of the ears. To make this, I simply added small strips of Apoxie Sculpt to the backs of the ears after they had been smoothed. You’ll see now in the photos that I’ve taken the face shield off of my helmet. I’ve only done this because my face shield was clear and I would need to later turn it black. If you start with a black face shield do not take it off. Leaving it attached to the helmet will make your life so much easier later. Also don’t be like me. Just get a black face shield. Once you’ve sanded the Apoxie Sculpt smooth, it will be time to add even more filler! 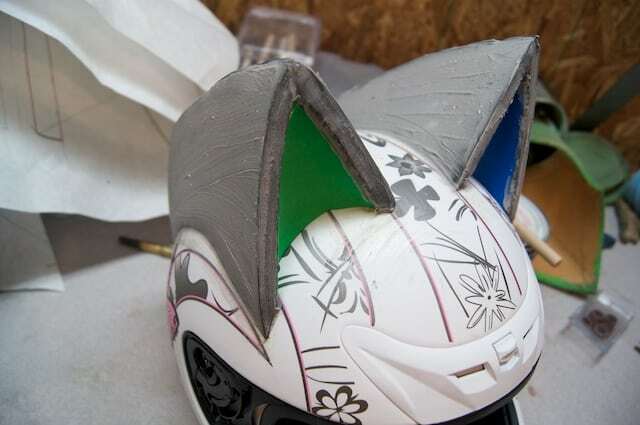 Using the same drywall filler as before, I added a layer of filler around the base of the ears (minus the curved area in the front) in order to make the transition between ears and helmet perfectly smooth. I added a layer, let it dry, sanded it smooth, and repeated this process until there was no discernible line between the ears and the helmet. You can also take this opportunity to smooth out the seam between the craft foam at the front of the ear and the Apoxie Sculpt around it. 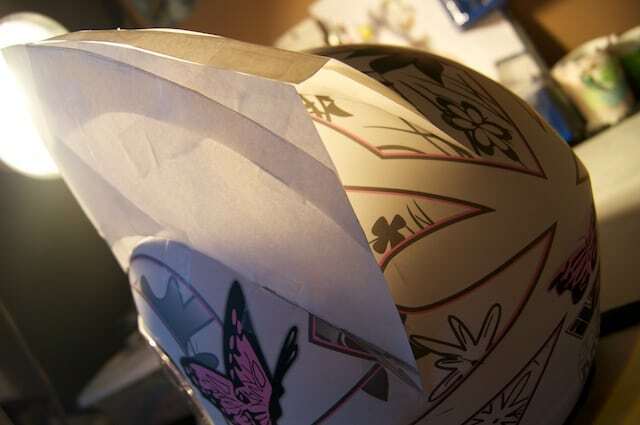 To do this, I added very thing layers of filler to the seam line and nothing else. I still kept the craft foam mostly uncovered. I also used water and my fingers to smooth the seam out as much as I could before the filler dried. Then, once it was dry, I very lightly sanded it smooth with a fine grit sand paper, being very careful not to damage the craft foam. Step 10: Tape off anything you don’t want covered in paint. 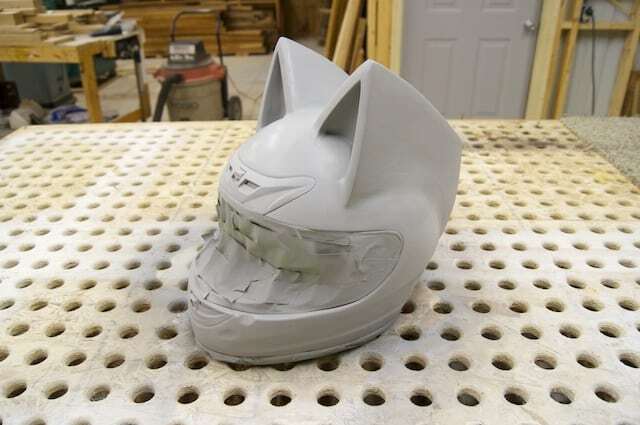 Now that the ears are smooth, it is time to cover the entire helmet in a few layers of automotive filler primer. Before spraying it down, cover any area you don’t want covered in paint with masking tape. I covered my face shield area and the black strip around the bottom of the helmet with Frog Tape, but any kind of masking tape or painter’s tape will work just as well. 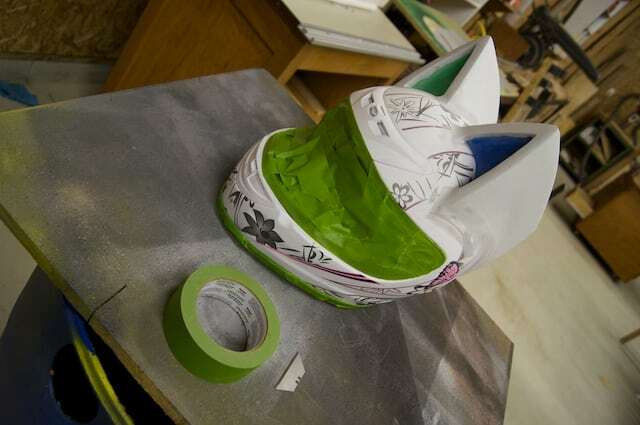 Once it’s all covered, start covering it in layers of filler primer! I used the 2 in 1 filler and sandable primer from Rustoleum. 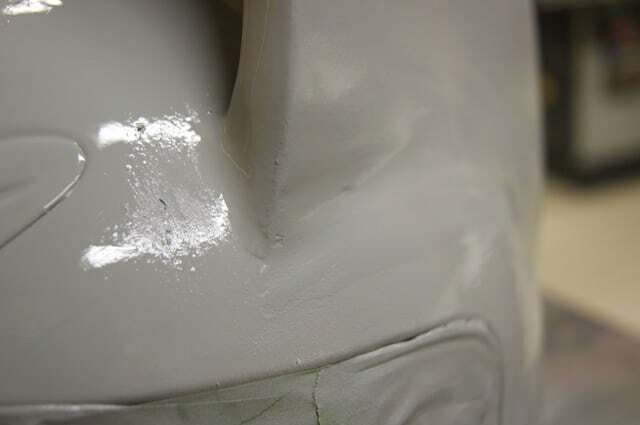 The filler primer will not only help smooth your helmet out even further, but it will also help you see areas on your helmet that still need some work. 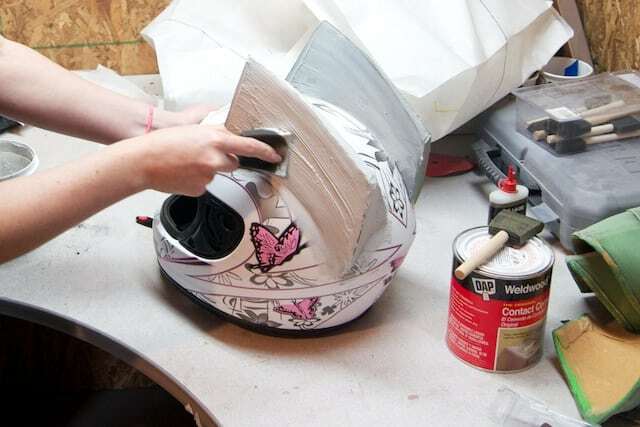 Just keep adding layers of filler primer and sanding round areas down until your helmet is completely smooth! 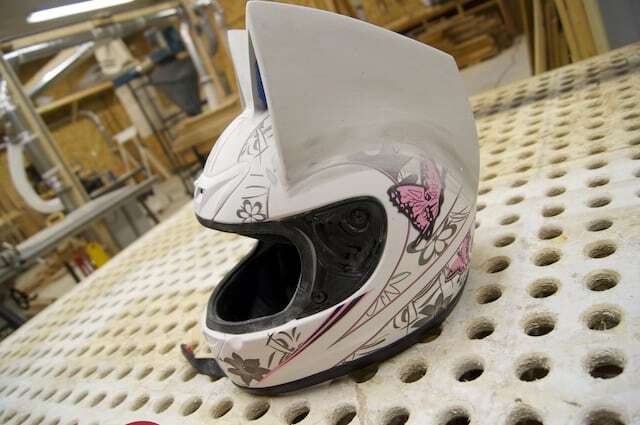 It will take a lot of work and a lot of layers, but eventually your helmet will be looking perfect! 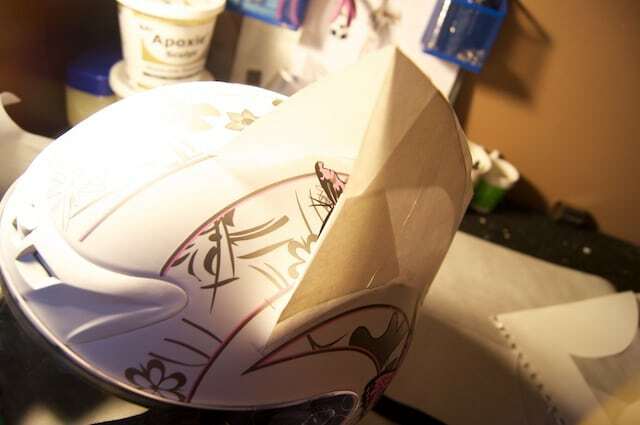 While the masking tape is still on your helmet, start painting! 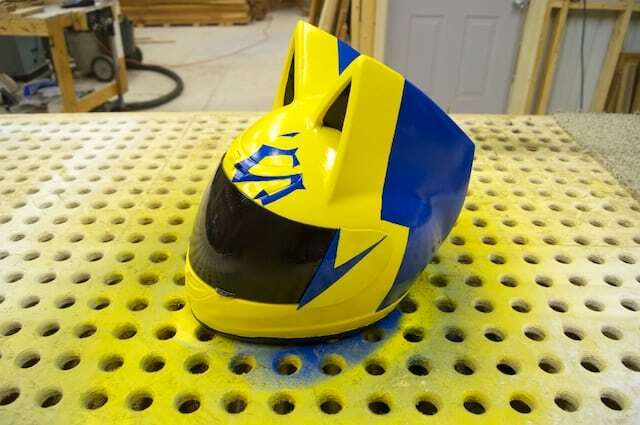 Start by covering your entire helmet with a few layers of yellow spray paint. 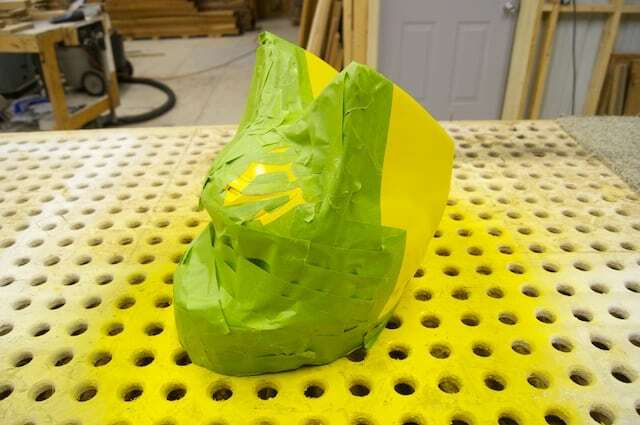 Once the yellow is dry, tape off all the areas that need to stay yellow, including the “S” shaped emblem at the front of the helmet. To get the “S” shape, I printed out a template I found online to the correct size and used it to cut the shape out of a large area of masking take before sticking it to the helmet. It was a bit tricky, but it worked! Once everything is taped off, you can start adding layers of blue. 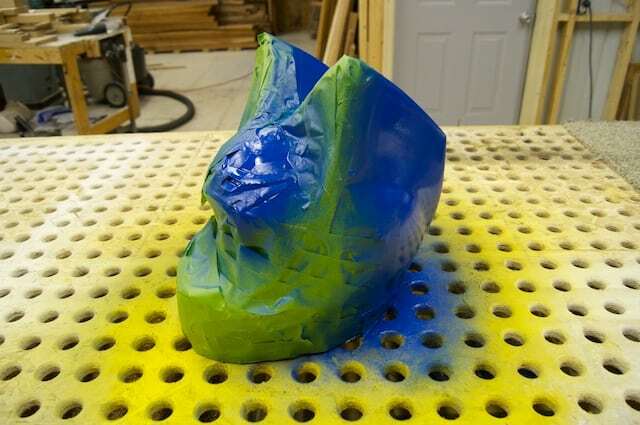 The blue covered the yellow extremely well, so you should only need a couple of layers. 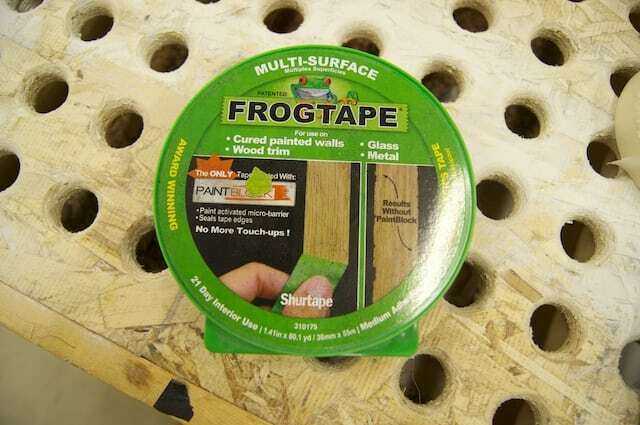 Once it’s dry, just before ripping the tape off, it is a good idea to run an X-acto knife blade along the edges of the tape to separate the tape from the paint. Sometimes the paint can pile up pretty thick over the tape and if you try to just take the tape off, you can accidentally rip up some of the paint along with it. Better to be safe and cut around all the edges first! Once you’ve made sure to cut along the edges, carefully lift the tape off and admire all those crisp lines! You should also take this time to paint the insides of the ears black with an acrylic paint. Just use a small flat brush and carefully paint the black in. Celty’s helmet has a couple of details on the sides of the helmet that attach onto the face shield. You can make these easily just by using Worbla, filler primer, and paint. Just cut a double layer thick piece of Worbla out in the right shape to fit over the ends of the shield. Then cover the surface with filler primer, sand, and repeat until it is smooth. 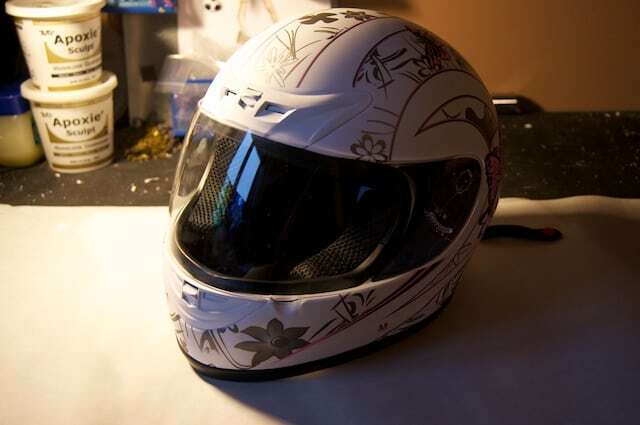 Last, paint with spray paints like you did with the helmet. Start with a yellow base coat, tape off the details, and add the blue on last. 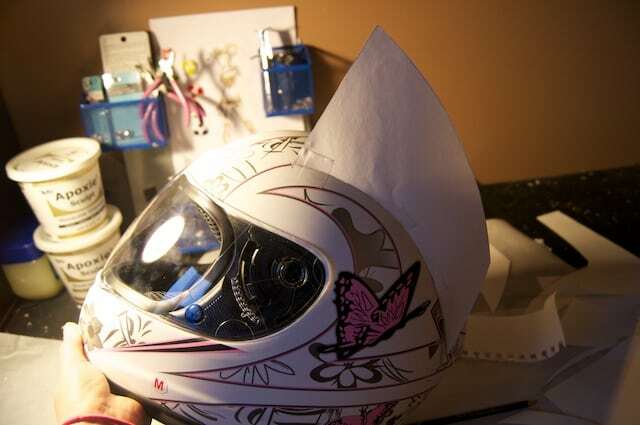 Once its done, attach them onto the face shield! Hot glue is an easy and effective solution for this. The last thing you should need to do is seal your paint with a clear enamel. I used a clear gloss on mine, but you can also find matte or satin finishes if you don’t like the gloss. If you bought a helmet with a black face shield as I recommended, you won’t need to do anything else at this point. 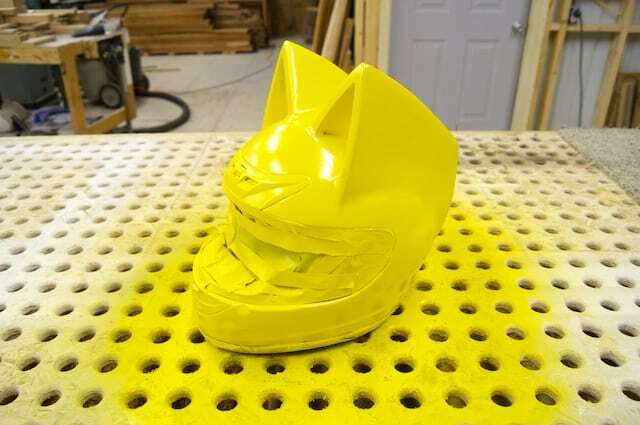 Your cat ear helmet is done! If you are like me, however, and decided to buy a helmet with a clear shield, you’ll need to find a way to turn the face shield black. At first I tried dying the shield black, but the protective coating on the shield prevented the dye from sticking and it didn’t even give me the slightest bit of a black tint. I ended up used a black spray tint for tail lights to do it. In hindsight, I should have just found a helmet with a black face shield because the effort it took to make the shield black and attach it back onto the helmet was not worth the trouble. Since the ears prevented me from simply snapping the face shield back onto the helmet, I had to cut off the attaching pieces from the inside of the shield and smooth it down with my Dremel. Then, I used Velcro to attach the shield back on to the helmet where it needed to go. My face shield won’t slide up and down anymore now, and is nearly impossible to see through with the tail light tint over it. The tint also likes to peel itself off of the face shield if you are not careful with it. I had to remove the tint and redo it three times before I was able to keep the face shield looking nice long enough to seal the tint with the clear enamel for protection. It stays on fine now with the enamel, but getting it to that point was rough. Learn from my mistakes. Just get a black face shield.